Wellington, FL - April 11, 2013 - The final show of the Adequan Global Dressage Festival (AGDF) began Thursday at The Stadium of the Palm Beach International Equestrian Center in Wellington, FL. 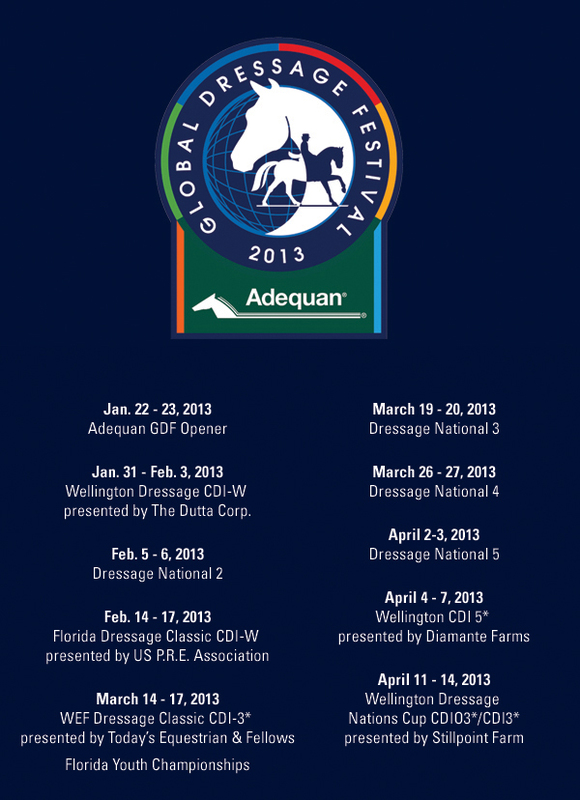 The grand finale of the AGDF is the Wellington Nations Cup CDIO/CDI3* presented by Stillpoint Farm, which will run April 11-14, 2013. Entries have boomed for the AGDF's final weekend, fostering highly competitive CDI and National classes. Spectators will not want to miss the high-caliber international competition to be seen throughout the weekend as ten teams representing various countries compete for their nation's glory. The FEI Prix St. Georges CDIO 3* and the FEI Grand Prix CDIO 3* will be hosted Friday at 8:30 am and 2:55 pm, respectively. These classes are what will determine this year's Nations Cup team results. The Wellington Nations Cup is the only non-championship Nations Cup held in the Western Hemisphere and is the first-ever to have teams comprised of both Grand Prix and Prix St. Georges horses. The inaugural competition held last year was wildly successful and 2013 is sure to be another thrilling presentation of international competition at its finest. The FEI Intermediaire-I Freestyle CDIO 3* will see its competitors on Saturday beginning at approximately 3:45 pm. Their competition continues into the evening session at 7:30 pm. The FEI Grand Prix Freestyle CDIO 3* will begin Saturday evening at 8:30 pm following the end of the I-1 Freestyle. Competition will wrap up on Sunday beginning with the FEI Intermediaire-I CDIO3* at approximately 8:00 am and concluding with the FEI Grand Prix Special CDIO 3* at approximately 2:00 pm. A Performance You Won't Forget! Saturday evening's exciting competition will be accentuated by a special performance by Janette Sassoon and Valiant. Sassoon and Valiant are a talented pair competing at the Prix St. Georges level, but what makes the duo truly exceptional is the fact that Valiant is completely blind. Their spell-binding performance demonstrates the powerful bond between humans and horses and will be sure to amaze all in attendance. The pair will perform on Saturday night after competition before the awards presentation. Saturday night spectators can enjoy free general admission and parking in addition to the opportunity to win fantastic raffle prizes! Families are invited to partake in the face painting and petting zoo attractions. In Thursday's competition, Evi Strasser and Renaissance Tyme finished with a score of65.617% to win the afternoon's FEI Grand Prix class sponsored by Stillpoint Farm. The great success of the AGDF would not have been possible without the generosity of title sponsor, Adequan. Equestrian Sport Productions would like to extend their greatest thanks to Adequan and all of their sponsors for being an integral part of this fantastic show season and for showing their unwavering support for the sport of dressage. The Matute Family - Juan Jr., Maria, Paula, and Juan - shown here with Michelle Hundt of ShowChic, won the Best Turnout Award at the FEI jog. For more information, results, and ride times, please visitwww.globaldressagefestival.com. The Adequan Global Dressage Festival (GDF) is one of the world's largest international and national dressage circuits featuring five CDIs, including a 5*, the first non-championship CDIO Nations' Cup in the Western Hemisphere, and nine U.S. national events.The Adequan GDF is offering more than $275,000 in prize money for the five international competitions making it one of the richest circuits in the world. In addition to the CDIs with national competitions, the Adequan GDF will feature six separate national shows to be held at the Stadium section of the Palm Beach International Equestrian Center (PBIEC) show grounds. The Adequan GDF encompasses almost 60 acres of the former Palm Beach Polo Grounds. The facility includes the Van Kampen covered arena (made possible by Kimberly and Frederic Boyer and family) and four outdoor arenas with world class footing, 200 permanent stalls, and a VIP seating area for the International Arena fully catered for relaxing and having an enjoyable experience. Founding Sponsors: Ashley Holzer and Diane Fellows, Today's Equestrian; Bethany Peslar, Everglades Dressage; Betsy Juliano, Havensafe Farm; Carol and Rebecca Cohen, Two Swans Farm LLC; Janne Rumbough, MTICA Farm; Mike & Roz Collins; Suhail and PJ Rizvi, Peacock Ridge; and Tim and Susie Dutta, The Dutta Corp.